Synopsis: Lemme give ya the quick version. Nagi and Hayate are doing a little souvenir/window shopping in Vegas. Everyone is enjoying their time in Vegas now since the competition is over. Anywayz, Hina is contemplating her next move coz she has sooo NOT given up on Hayate-kun just yet. 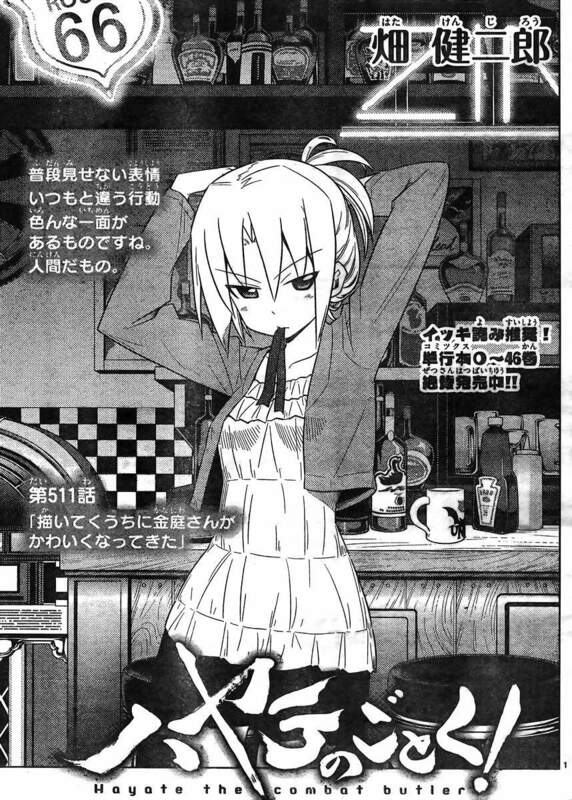 For her, the debt is gone, but with Hayate still being a butler, the status quo hasn't changed... no! This is her chance to act! This is what she wished for isn't it? What should she doooooo? At least I'm not the only one who thinks Kananiwa is cute. Definitely NOT Dolly. Nagi wonders where Tsugumi went. Anyway, Sakuya's reporting in to old man Mikado and he's like all "everything is proceeding as planned." No doubt he's planning something with A-tan again. Finally, we get a shot of Ruri Tsugumi because Hata is reminding us that he knows his plotlines and he'll finish them all off by hook or by crook! 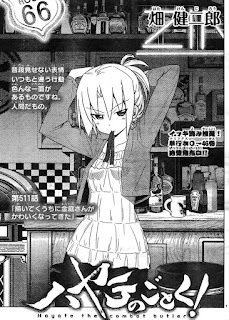 Review: Well, this chapter brings a little bit of relief to me because the bomb between Nagi and Hayate hasn't been set off yet -- but it will soon be. It's going to be bad for my heart, but it will be good in the end for Nagi's sake. 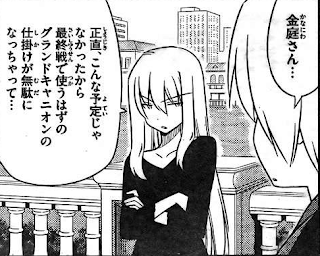 Anyway, I just hope Hata's not planning to bring back the status quo again by having Hayate lose the money in this Grand Canyon thing and then bringing his debt back again. 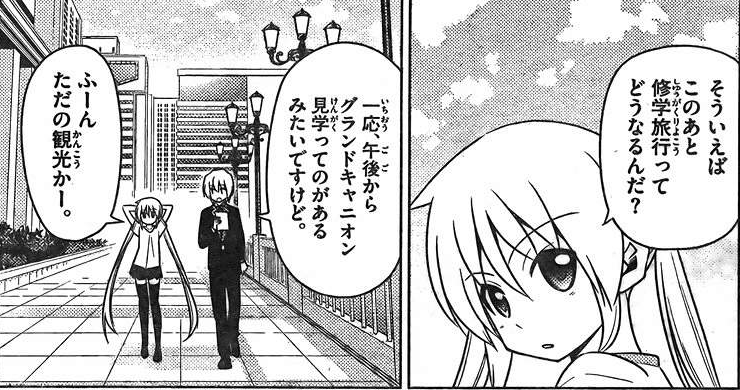 I would say the highlight of this chapter would be Hina's reflection since it's clear that she hasn't given up on Hayate just yet (unlike how some people saw it) and she believes that things are still the same -- just that Hayate doesn't have his debt now. Fanart Corner: Finished this one. 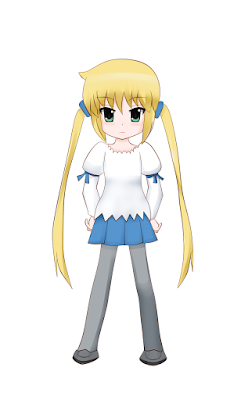 I might use this for Nagi's birthday on December 3... along with a photo I've done. thanx for this article as i was not able to get the raw and i kind of expected 511 will b filler. Awesome! Always nice to hear from fellow Nagi fans. I always check your reviews after reading the updated chapter, And helps a lot when English version is not out, like now. Haha! There are so few comments on my blog that I try to reply whenever I can. 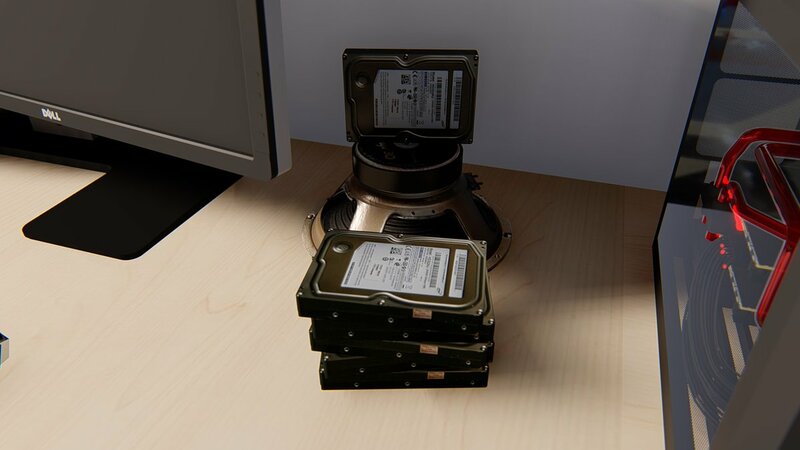 Red Hawk Scans themselves used to release the chapters the fastest. Right now, it's doubtful if there'll even be an English release until a new translation team picks up the manga once again. Wait ,there wont a version there on red hawk or there wont be any English translated version on any site! 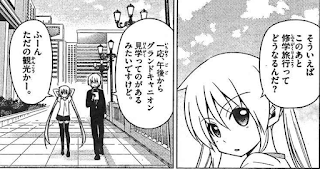 Have you ever considered doing translations for Hayate. I was wondering because, as you know, Red Hawk went down. I have indeed. My main concern is that my Japanese level is not quite up to par yet. I have to consult some kanji dictionaries and check the coherence of the readings with the actual text several times before I can even understand one page of the manga -- and that's given that the furigana readings are actually right there. My other concern is that of time and effort. 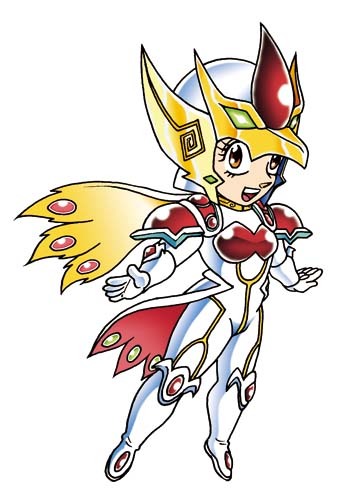 I already have to make time to do my fanart pieces (and I enjoy doing those) and while editing text into a 15-16 page manga wouldn't really be that hard in terms of effort, I would have to invest a lot of time within the week to be able to provide a competent translation with some good edits. I can probably sustain it for the first month or so, but I'm not sure how long I would be able to continue without burning out. That brings up the issue of consistency since a one-man team can only last so long given that I do have real life stuff to worry about as well. Finally, doing scanlations is totally uncharted territory for me. I wouldn't know where to begin such as where I'm supposed to get the raws for editing and which channels I should release the translations to. 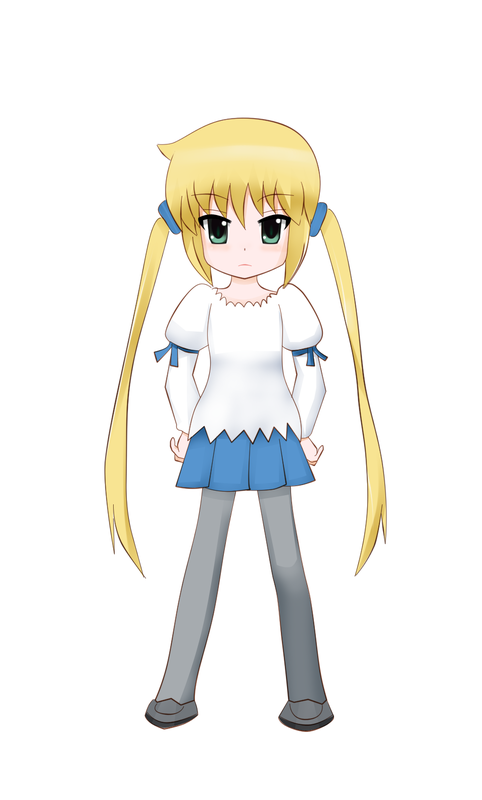 Anywayz, long story short, I'm totally devoted to Nagi... but I don't think I'm the right person to pick up from where RHS left off -- especially for a series as established as Hayate no Gotoku! Let's just hope that some veteran groups/translators do pick up this manga eventually. Even if you can't translate it I still enjoy reading your little synopses and reviews. Keep up the good work! Nice to know that my work is appreciated. Thank you. Sure thing. I've also heard some rumors that Japan might be cracking down on piracy and scanlation groups, so that's even more reason not to try scanlating the manga myself just to be safe. Just a little heads that ch. 511 is out in English now at all manga hosting sites. where!! thanku so much I'll go check it out!!! gag manga........i was naive to think hata will end this in my life time.